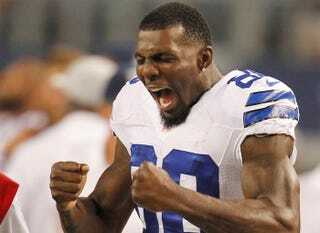 Cowboys receiver Dez Bryant has a habit of getting really energetic on the sidelines. As we've found out via the NFL's access to players, Bryant just likes shouting to keep his teammates' morale high. He and corner Orlando Scandrick were yelling on the bench last night so the Cowboys could hold their lead over the Bears. When asked about his behavior after the game, Bryant clearly didn't care what anyone else thought. They can't print the swears, Dez, but OK. He's right, though. If the Cowboys lose, they're the same old Cowboys. As long as Bryant isn't punching Tony Romo in his fucked-up back to fire him up, who cares about the method of motivation? Dallas will be better than 8-8 for the first time in four years, so Bryant's yelling isn't dragging them down.